As one of my knitter friends likes to point out, I knit a lot of items for other people (and not just when Christmas rolls around either). You could chock it up to the fact that I’m not a selfish person by nature, but honestly, I can’t (or don’t always like to) knit for myself all the time. There’s only so many items you can make for yourself before you realize that no you don’t really need another hat/fingerless mitts/scarf etc for yourself. Or maybe its just me that feels that way. Anyway, I finally (finally!) finished a project for myself just last week. 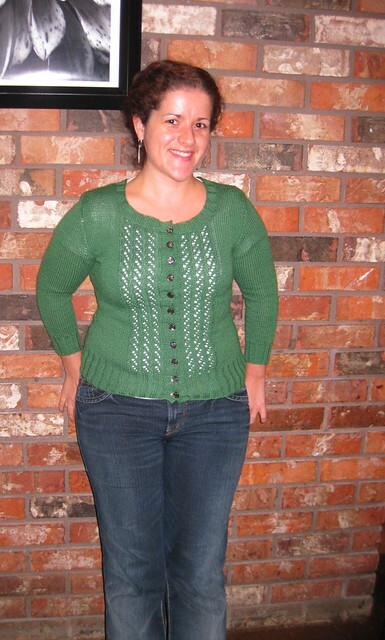 This lovely green cardigan was started back in mid-June and I kept picking it up, putting it down, and picking it up again while I worked on other projects. I finally gave myself a push a few weeks ago when I convinced myself that I should finish the damn thing and wear it on Christmas Day as its such a lovely green colour. Well the mental deadline was apparently all I needed, as I finished it faster than I thought! I gotta say, I’m pleased as punch with the final outcome. Huzzah! 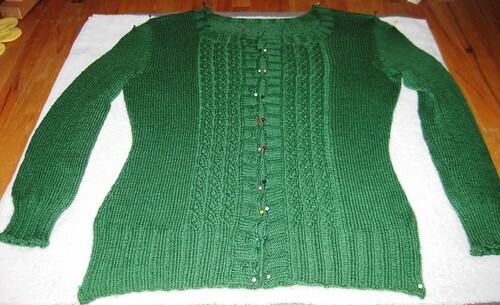 You are currently reading At last, a cardigan at When Gaia Smiles.